Ancient Corinth was one of the three major powers in Greece in the 5th Century BC, and took part in all the main battles against the Persians, both on land and sea. After the Persian invasion had been dealt with, in 479 BC, Corinth came into conflict with the new powerful naval force which was Athens. Corinth was the main instigator of the Peloponnesian War, but despite its favourable outcome, it did not ensure naval supremacy for the city. Instead, it raised Sparta to being the most powerful city-state in Greece. Soon after, Corinth allied itself with Athens and other cities against Sparta, leading to the start of the Corinthian War, but this was all interupted by a new power from the North, Phillip II of Macedon. Most city-states united in their opposition to Phillip, but after his victory in 338 BC, he became the first of the Macedonian sovereigns to set up a garrison at Acrocorinth. Corinth's wealth and influence had always extended throughout the Isthmus region, including the two Gulf ports of Lechaieon and Kenchreae, the Diolkos overland track, the Sanctuary of Heraion near Perachora, and the nearby Sanctuary at Isthmia. Corinth 'sponsored' the Isthmian games, which were only second to Olympia throughout the ancient Greek world, held every two years. About 200 years after the Macedonian conquest, Rome started taking an interest in Greek politics. Corinth became the opposing capital city of the Achaean League, and as such the Romans took their revenge upon it in 146 BC, by destroying the city completely. Only seven Doric columns (above) of the temple of Apollo survived. A hundred years later, Julius Caesar introduced a project for the reconstruction of destroyed cities, including Corinth, however, in 44 BC Caesar was assassinated, so the reconstruction was continued and completed under the Emperor Augustus. In 52 AD the Apostle Paul came to preach in Corinth, and established an important Christian church in the nearby port of Kenchreae (Cenchreai) on the Saronic Gulf. The ancient city of Corinth continued to be developed by further Roman Emperors including Nero, Hadrian, Herod Atticus, Theodosius and Justinian. The old city became a new major trading centre of the vast Roman Empire, with a mixed population of Greeks, Jews and Romans. Corinth was mostly destroyed in the eathquakes of 365 and 375 AD, followed by Alaric's Visigoths invasion in 396 AD. A large stone wall was erected from the Corinthian to the Saronic Gulfs during the reign of Emperor Theodosius II (408-450). This 6 Roman-mile wall, called the Hexamilion, protected Corinth and the whole Peloponnese from further Barbarian invasions from the North. This wall was further fortified with towers, 153 in total, during the reign of Emperor Justinian (527-565). The Hexamilion wall is the largest archaeological structure in Greece, and protected Corinth and the Peloponnese (Medieval Morea) until the arrival of the Sicilian Normans in 1147, who plundered the city and carried off most of the population into captivity. There followed various Medieval invasions by Frankish Crusaders, Byzantines, Turks, Venetians and eventually Ottoman Turks in 1715. The city was finally destroyed by Turkish forces during the Greek War of Independence, 1821-1829, and a massive earthquake in 1858 left all remaining buildings surrounding Corinth in ruins. The present city of Corinth was totally rebuilt 3kms away, on the Corinthian Gulf. The finds at the museum are displayed in four rooms. The first room has showcases displaying artifacts from the early Neolithic, Helladic and Mycenaean periods. The second room contains finds from the Archaic and Classical Greek periods. The third room has all the sculptures, floor mosaics and frescoes which were found in the excavation of the city, with most being from the Imperial Roman period, with Byzantine glass and pottery displayed in the showcases. The fourth room contains the finds from the Asclepion of Corinth, votive offerings, fragments of statues and inscriptions. Outside in the central open courtyard, are many Roman statues and sculptures. The Museum and archaeological site is open daily throughout the year. Winter: 08:00 - 15:00 Summer: 08:00 - 20:00 Admission: 6 Euros. Most of the ruins uncovered at ancient Corinth, by various excavations, belong to the Imperial Roman period, apart from the 550 BC Doric temple of Apollo. Few remains survive from the ancient Greek times, due to the destruction of the city by the Romans. 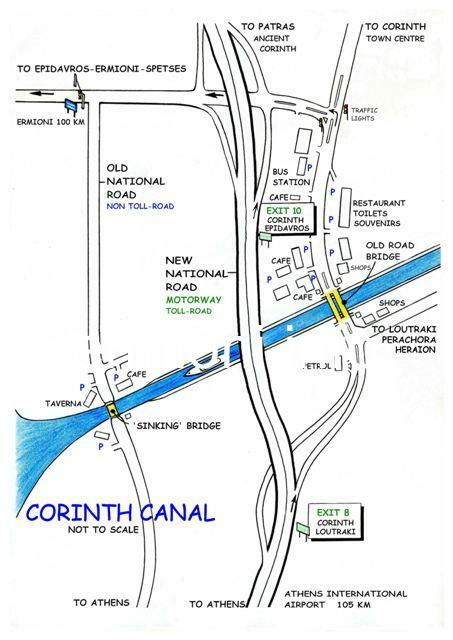 How to get to Ancient Corinth: From Ermioni, one needs to head North for the Corinth Canal motorway junction 10. At the motorway junction, turn left (West) towards Patras, and follow the motorway for approximately 10 kms. Continue towards Patras at the motorway divide. Exit the motorway soon after the giant sign for Ancient Corinth. Turn left to cross under the motorway bridge, then left again until you see the sign for a right turn which is under a small bridge. Continue until you arrive at the small village of Ancient Corinth. The village has many tavernas, cafes, kiosks, souvenir and gift shops on a pedestrianised street. The archaeological site and museum is at the far end of the village, going through a one-way by-pass system, where there are plenty of free car-parking spaces available. Please note: If you are also planning to visit the nearby fortress of Acrocorinth, the site closes at 15:00.